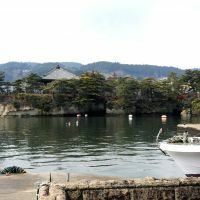 MATSUSHIMA, MIYAGI PREF. - Matsuo Basho, arguably Japan’s most famous haiku poet, is said to have been at a loss for words when he first saw the hundreds of pine-clad islets scattered around Matsushima Bay during a 17th-century journey to the Tohoku region. When the monster March 11 tsunami wiped out towns all along the Sanriku coast, killing or leaving thousands of people missing in Miyagi Prefecture, Matsushima’s famed cluster of about 260 islets served as a natural buffer, weakening the impact of the waves and largely sparing the coastal town from utter devastation, despite its proximity to the 9.0-magnitude quake’s epicenter. 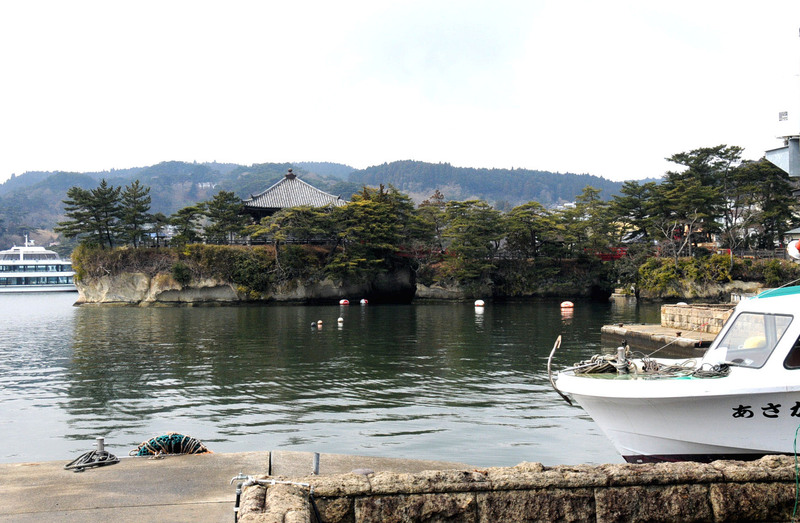 But while the beauty of Matsushima — revered as one of Japan’s three most scenic spots — was preserved, a plunge in tourists is hindering the community’s efforts to come back from the Great East Japan Earthquake. 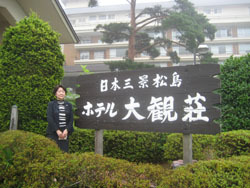 Yuko Isoda, the “okami,” or chief manager, of Hotel Matsushima Taikanso, the bay’s largest inn, has worked there for the past 40 years. Her father built the hotel in 1951 on a hill overlooking the bay, and what was initially a three-story wooden inn with 30 guest rooms has gradually been developed into a sprawling 39,600-sq.-meter complex with more than 250 rooms. A spacious “rotenburo” (outside bath) was built in December. But even though the summer tourist season is now at its peak, and various festivals are livening up the town’s streets, Isoda said the hotel’s reservations from general customers is roughly one-tenth compared with previous years. Taikanso only sustained minor damage in the quake — a few windows were broken and some floors suffered water damage when the temblor activated fire sprinklers. The hotel served as a temporary shelter in the aftermath of the tsunami for hundreds of locals and tourists who climbed the hill to escape the waves, even though electricity and water were knocked out for weeks. In total, 15 people from Matsushima died in the March disasters, far fewer than the thousands who were killed or remain missing in the nearby cities of Ishinomaki and Kesennuma, also in Miyagi Prefecture, which felt the full impact of the giant tsunami. In Matsushima, the waves reached a height of 3.8 meters, wrecking the first floors of buildings facing the bay, but paling in comparison to the tsunami of up to 15 meters that swept through other coastal towns. In the months following the catastrophe, hundreds of reconstruction workers and volunteers lodged at Taikanso, and it wasn’t until Aug. 6 that the hotel fully resumed regular operations. 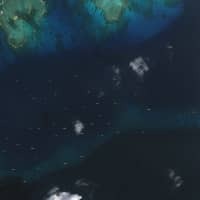 Before Aug. 6, work to repair destroyed infrastructure and difficulty in procuring certain food produce meant that the hotel was unable to provide its guests with the immaculate standard of service it is known for, and it instead offered customers a discount price and less elaborate cuisine. But unlike other inns, which were forced to lay off employees or even close down, Isoda said she was able to retain all of Taikanso’s roughly 200 employees, at least for the time being. She said the hotel held a meeting in late March, during which she reassured her employees — many of whom lost loved ones or their homes in the disaster — that they could continue working for the hotel, although she stressed they could not let the calamity affect their work. “Matsushima was the only area along Route 45 that survived the disaster. I believe our lives were spared for a reason, and I want all of you to stay strong and work hard,” Isoda told her staff. The debris has been removed from Route 45, the national highway that runs along the Pacific coast through Matsushima and up to Aomori Prefecture, while the JR Senseki train line that connects Sendai and Ishinomaki has been partially restored. In an effort to bring back tourists, sightseeing ships resumed tours around Matsushima Bay on April 29, and the town hosted a large Bon festival and staged other events in mid-August. But the improved transportation links and festivities have so far failed to pull in tourists. “We just want to get back to normal, but for that to happen we need more tourists to visit,” Isoda said. 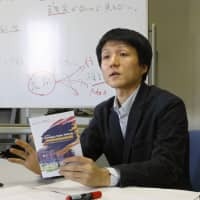 Kyuichiro Sato, president of the Matsushima Tourist Association, said the number of tourists visiting the town has dropped substantially due to radiation fears, as Miyagi neighbors Fukushima Prefecture, where the crippled No. 1 nuclear plant continues to spew radioactive substances. The nationwide sense of mourning and concerns over traveling to tsunami-hit areas are also major factors, he said. 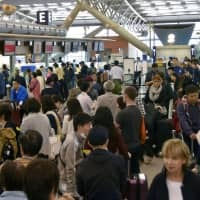 “There were almost no tourists in April, and the numbers in May and June have been around 26 percent of what we expect during regular years,” Sato said. In a normal year, Matsushima draws around 3.7 million tourists, compared with 3 million for Miyajima, Hiroshima Prefecture, and 2.6 million for Amanohashidate in Kyoto Prefecture — Japan’s two other top scenic locations. Sato said many of his relatives and friends were killed in the disasters, while his home in Minamisanriku, Miyagi Prefecture, which had stood for 300 years and spanned 11 generations, was swept away by the tsunami. He is currently living in an apartment his family owns in Sendai. 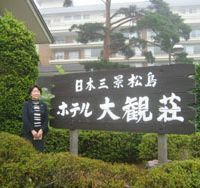 Sato also serves as the president of Minamisanriku’s forestry workers union, and owns a museum in Matsushima that honors Date Masamune, the powerful Tohoku daimyo feudal lord who founded Sendai. The tsunami ruined the first floor of the museum — which features dozens of lifelike wax dolls and traces the major events in the life of the famous one-eyed samurai — but the facility reopened April 23. Sato said he hopes that as the town’s large hotels and “ryokan” resume regular operations — including Taikanso, Matsushima Century Hotel, Ichinobo and Hotel New Komatsu Kofutei — the number of tourists will increase. But he stressed that he wants travelers to view firsthand the devastation wrought by the earthquake and tsunami, and to talk to the victims and learn about their experiences. “I believe we experienced a tsunami that occurs once in a thousand years. The Sanriku coast has been totally destroyed. I’d like people to view the scene firsthand, and to feel the impact of the disaster and talk to the victims, because each and every one of them has a story to tell, their own personal tragedy,” he said. “And afterward they should take some time to think about what they just saw. Matsushima has miraculously been spared. They should enjoy the spectacular views, and also eat local seafood and buy some souvenirs, because this will all help in rebuilding the area,” he said. 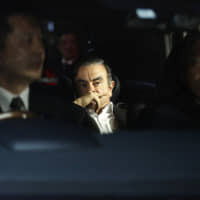 Sato said the nuclear crisis has also scared away a number of foreign tourists — mainly from China, Taiwan and the United States. Ironically, before the disaster, Tohoku did not have a high profile overseas, and foreign travelers have traditionally been drawn to famous tourist spots such as Kyoto and Hiroshima, he said. But now that the historic Hiraizumi site in Iwate Prefecture has UNESCO World Heritage status, Sato said there are two good reasons to visit Tohoku — to learn about its cultural heritage and witness nature’s wrath firsthand. “If Matsushima can regain its vigor, it will help liven up the whole region. Please, please come visit us,” he said.